The Senate Has 60 Votes to Stabilize Obamacare. But Will There Be a Vote? 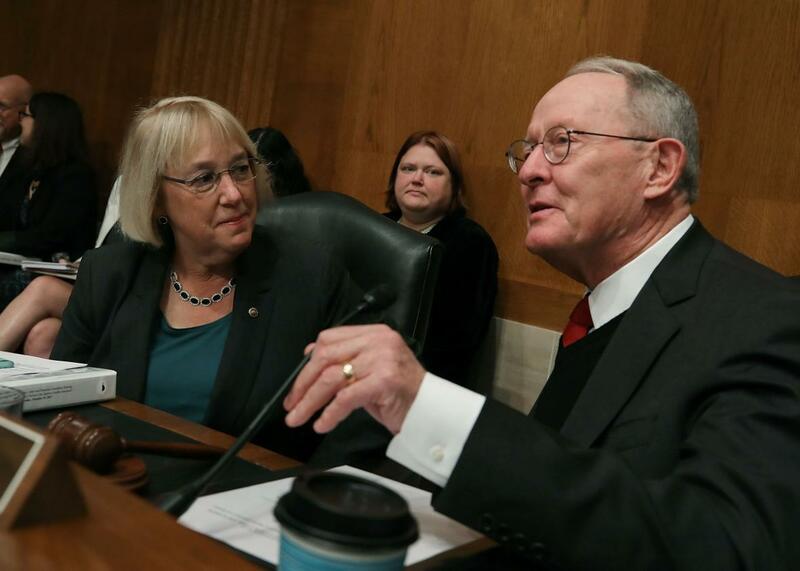 Senators Lamar Alexander and Patty Murray at the Capitol on Thursday. Speaking on the Senate floor on Tuesday, Tennessee Sen. Lamar Alexander proudly read the names of nine more Republican who had agreed to co-sponsor the bipartisan health care bill he negotiated with Washington Sen. Patty Murray. Near the end of his speech, Alexander was handed a note that two more Republicans had also signed on. That, as Alexander proudly noted, brings the number of Republican sponsors, including himself, to 12. In this case, that could be the magic number. If all 48 Democrats vote for the bill, the dozen Republicans would give it a filibuster-proof 60 votes. And Democrats across the ideological spectrum seem eager to deliver. Red-state senators like Sen. Claire McCaskill of Missouri, Sen. Joe Manchin of West Virginia, Sen. Heidi Heitkamp of North Dakota and Sen. Joe Donnelly of Indiana practically stampeded at the opportunity to co-sponsor the bipartisan bill and show off their willingness to change Obamacare without repealing it. Vermont Sen. Bernie Sanders, representing the left flank, supports it too. McConnell hasn’t said much about the compromise. But Senate Majority Whip John Cornyn, who said he personally thinks the bill needs more state flexibility, was clear about what it would take to bring it to the floor. Indeed, he’s not. The president, who has waffled on the bill this week, offered another stream-of-consciousness take on the process Thursday morning, which seemed to indicate he was open to a stopgap fix to complement a permanent solution. By Friday morning, of course, he could flip opposing insurer “bailouts” yet again. Alexander is working to convince him. He picked up the crucial support of both Louisiana Sens. Bill Cassidy and South Carolina Sen. Lindsey Graham, the authors of the most recent effort to repeal and replace Obamacare, as co-sponsors, signaling the president needn’t sacrifice his repeal-and-replace efforts to sign this short-term bill. And in their respective floor speeches, both Alexander and Murray addressed the president’s primary objection to the compromise, emphasizing their willingess to make sure cost-sharing reduction payments go to consumers rather than insurers’ bottom lines. Getting Trump onboard only solves one of the bill’s political problems, though.. Senate Republicans, facing the threat of conservative primaries, aren’t going to call up a bill that “props up” Obamacare without certainty that it will pass the House, too. Trump’s support would give Speaker Paul Ryan a healthy dose of cover to bring it to the House floor, but it still might not be enough to overcome conservative objections. Even if Alexander-Murray can’t muster the support it needs to pass on its own in the immediate future, there’s at least one potential fallback option: the December tradition in which lawmakers, in a rush to get home for the holidays, dump everything they’re working on into the massive end-of-year appropriations package and hope that people aren’t paying too much attention. Alexander didn’t predict that this bill would pass soon. He did, however, predict that it would be law by the end of the year.